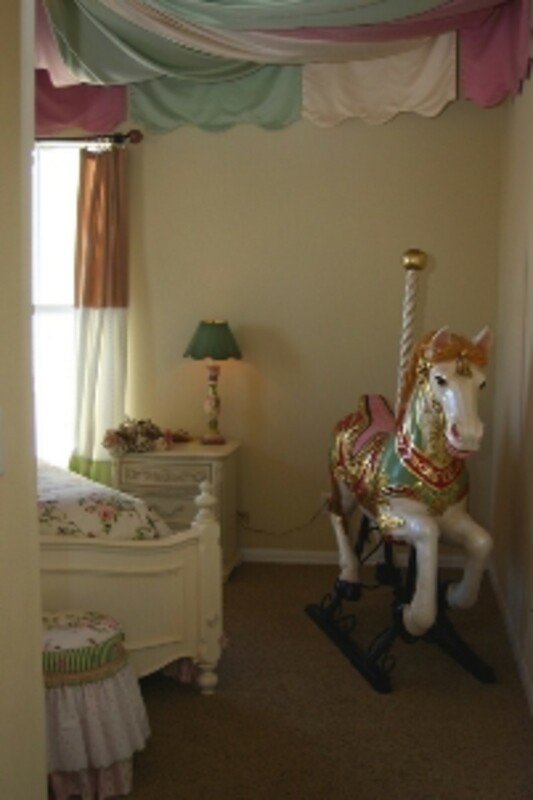 If you have ever considered designing a dream room for your little princess, carousel horses are a loved design by the very young to preteen girls. By planning ahead and doing some comparison shopping, you can turn your daughter's bedroom into a paradise fit for a princess. 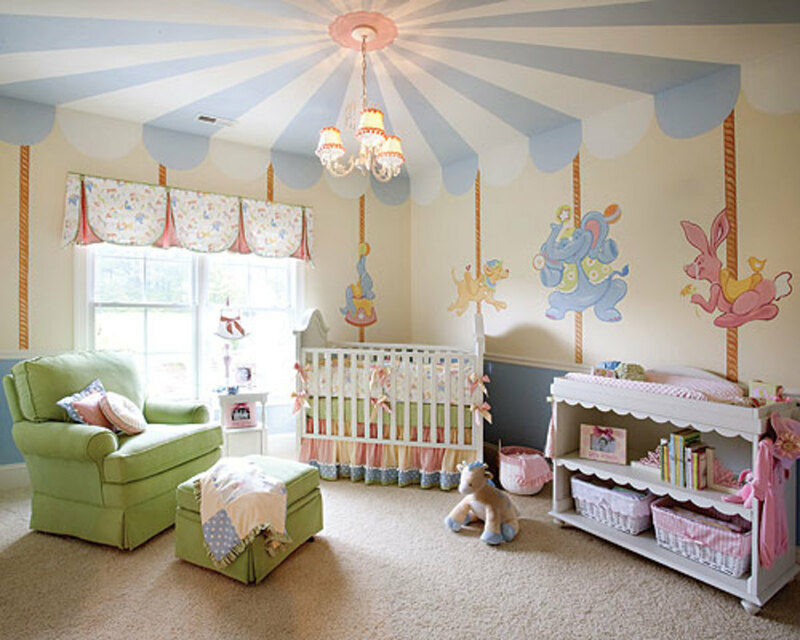 To give your daughter's room a real carousel feel, consider decorating the ceiling with fabric or paint. To achieve this look, you can sew a "circus canopy" of two or three colors. Locate the exact center of the room. Mark the center. There is normally a light fixture in the center of most rooms. Use a chalk line to snap equal "sections" of the ceiling so it is equally marked off much like pie sections. Separate each section with painters tape. Purchase ceiling paint (it drips less) in your chosen colors. Paint a different color in every two or three shades according to your color choices. McCall's offers many free sewing patterns online to sew a canopy for a ceiling. Using light colorful fabrics, you can sew a canopy from left over curtains or inexpensive fabrics. For patterns check out: http://www.sewsweetness.com/2010/09/mccalls-5827-play-canopy.html. This is a great alternative for an apartment where painting is not allowed. The canopy can be nailed to the ceiling just like a circus rooftop. 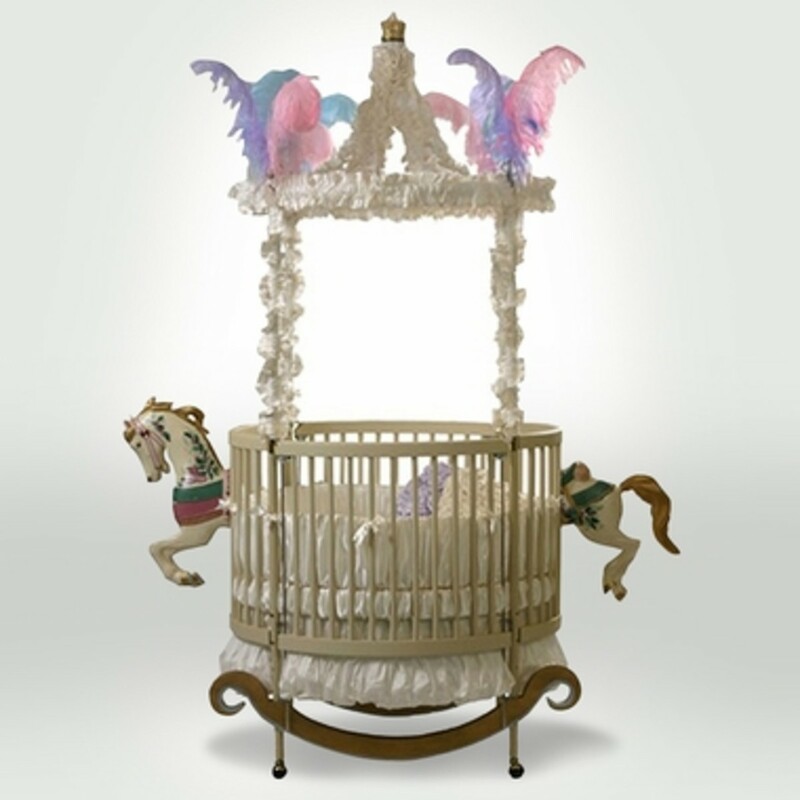 Instead of decorating the ceiling, a bed canopy would also be a wonderful addition to a carousel room. 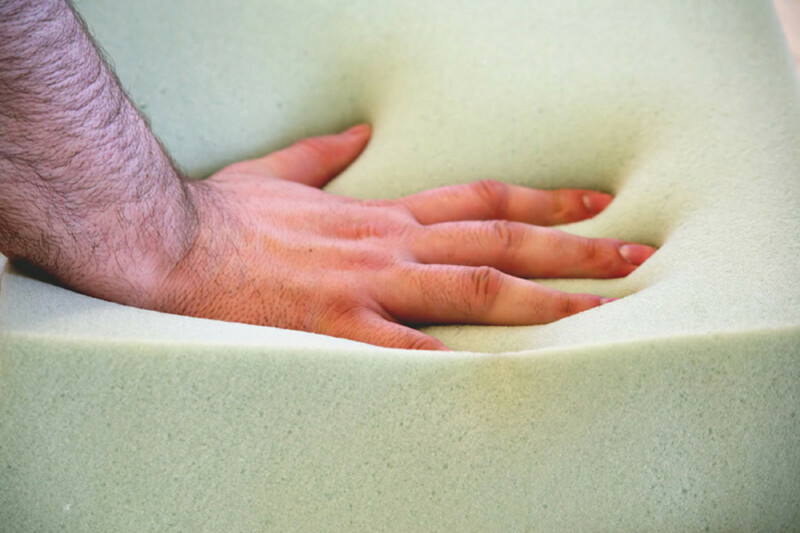 Beds can be purchased with canopies attached or a canopy bracket can be purchased and installed above a bed. Curtains should match the ceiling if a circus roof top is being used. Festive curtains in circus colors would be great to liven up a beige room. Tassels can be added for extra flair. Depending on your budget, you could either paint your walls a circus color such as pink or a pastel jewel tone and add a layer of texture to the walls for added interest. Other options include adding a mural or paying an artist to paint a mural for you. Murals are a great way to decorate and can be purchased for as low as $29.99. 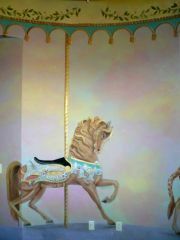 There are several colors and styles of carousel horse murals for sale. You can purchase a small one for a corner accent in a room or a large one that decorates an entire wall. One exciting way to create a carousel horse room for a princess is to add a real carousel horse. Horses are available in many styles and sizes. Wooden rocking carousel horses are available at stores like Target. You can purchase authentic horses from EBay that come painted or unpainted in standing and jumper styles in many different price ranges. 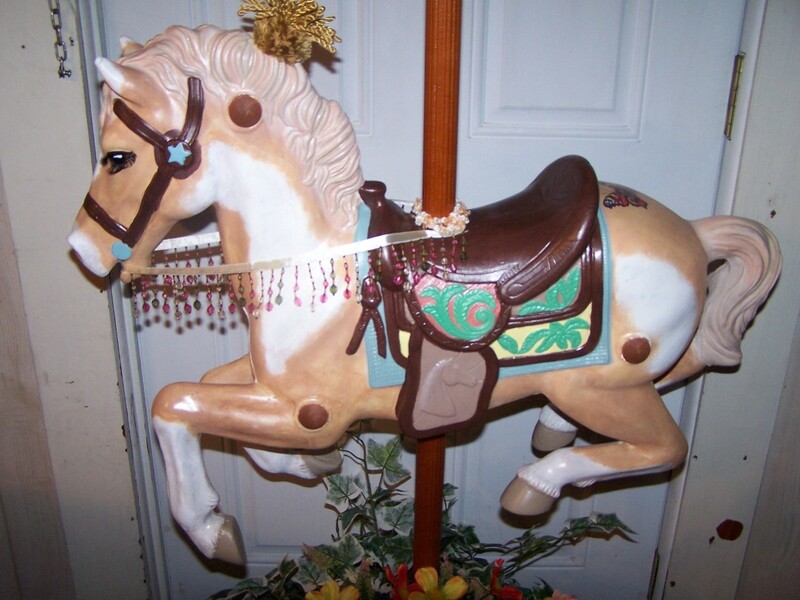 If price is a concern, you can easily make a carousel horse for very little money by purchasing an old fashioned spring horse from an antique shop or flea market. After you locate your horse, it will need a complete thorough scrub to remove debris that will get stuck in the paint. Take the spring horse outdoors and either hang it or lay it on newspaper or plastic. Make sure the horse is dry and coat it evenly with two smooth coats of white enamel spray paint. Give the horse one day to dry to a hard smooth finish. The horse is now ready for accents. Choose colors for its bridle, saddle, hooves, and mane. It is best to use hard enamel and paint the accents by hand with a brush. After you have painted the accents to your specifics, it will be necessary to apply a clear coat protective spray which is available at craft stores. This step is the most difficult and must be done in smooth strokes. This will protect the paint on the surface of the horse. If attaching the horse to a pole, you will need to drill holes on the top and bottom of the horse to the exact measurements of the pole. After drilling the hole, insert the pole and add a base. 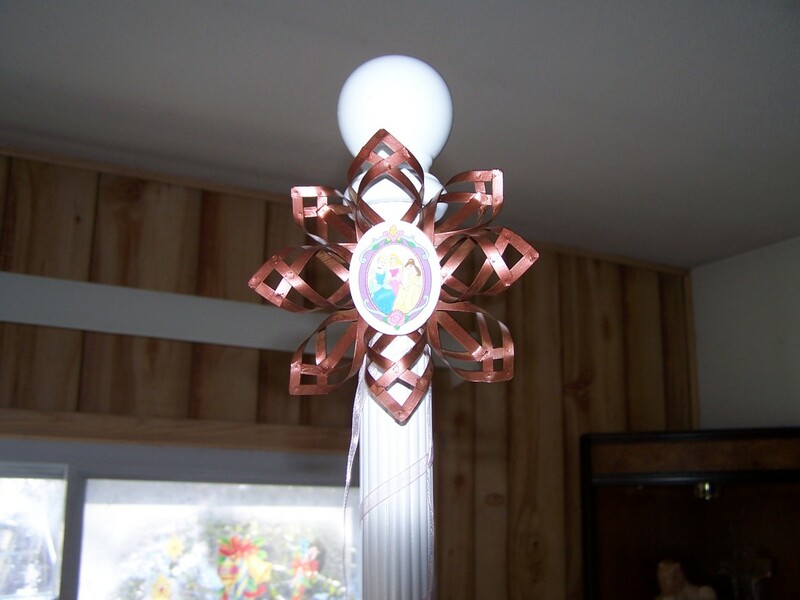 Decorative ribbon can be placed on top of the pole for extra flair. To complete the look of the room, small lamps in pastel colors add a cozy and festive feel to the room. To replicate the glow of a carousel, consider adding round Christmas lights around the room. This step will give the room the feel of a real carousel. Mirrors are a hallmark of carousels. They make real carousels come alive because they reflect both the light and vibrant colors of the carousel. Mirrors with gold beveled frames complete the carousel look perfectly. These can be purchased at places like Walmart or even at yard sales. 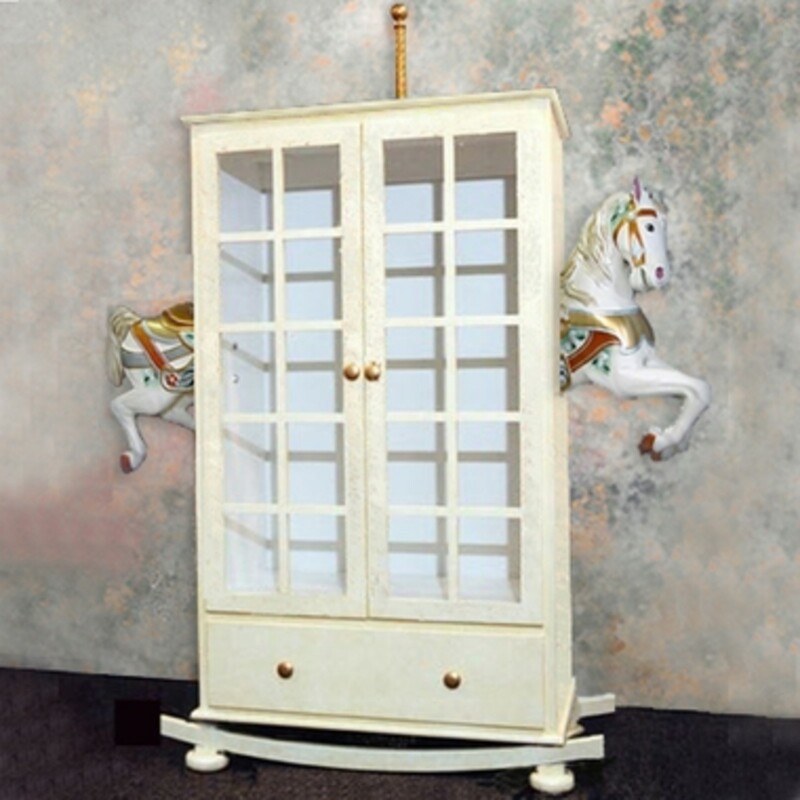 Antique carousel horse and reproduction carousel horse, carousel animal, rocking horse all custom painted your colors. Carousel horse stand, carousel horse base , poles, books, and supplies. Life size horses and unpainted carousel horse. A wonderful hub! I have seen these in movies and they are really grand and pretty. You spoke like an expert interior decorator. 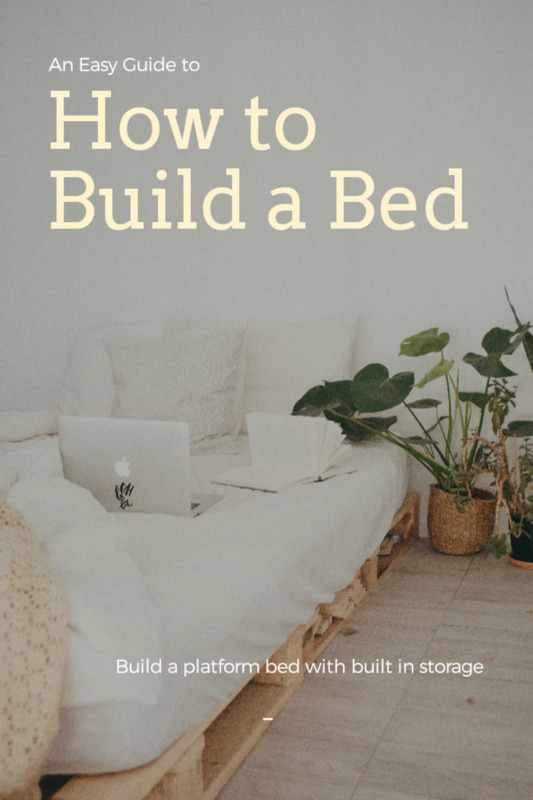 So, you can become a professional interior designer and create your success story. You are indeed versatile! 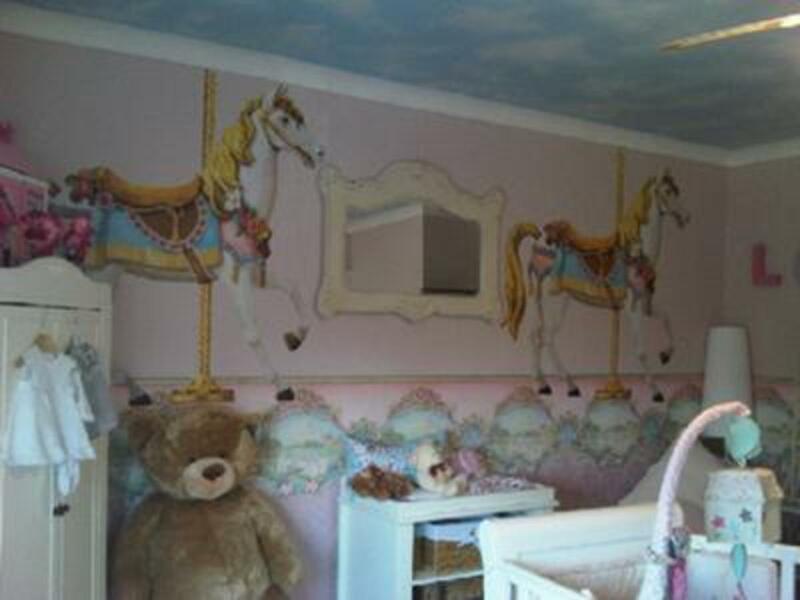 This detailed hub of yours made me dream of designing a carousel horse themed bedroom for my daughter in the future. Well-done! Absolutely beautiful! Every little girls dream room. Love this Hub! You could try www.themuralsuperstore.com. Good luck!
? It comes out blank. Are the cute animals created by you? they are just so darn cute!?! Thanks Gina. You can try www.divineliving.com. They have tons of murals and self sticking wall décor. Thanks for reading and good luck with your design. So beautiful Tammy! I'm am looking for the exact same wall decore. The seal,bunny, dog and elephant. Can u tell me where I can buy them? I would love to fix my daughters room just like that!! looking for horsemen.If you are horse lover and want to find someone who also loves horse, please come [equinemingle.c, om].EquineMingle is the largest international community for equestrian and countryside lifestyle lovers. It's a place where single equestrian lovers, cowboys, cowgirls and rural singles meet and date. 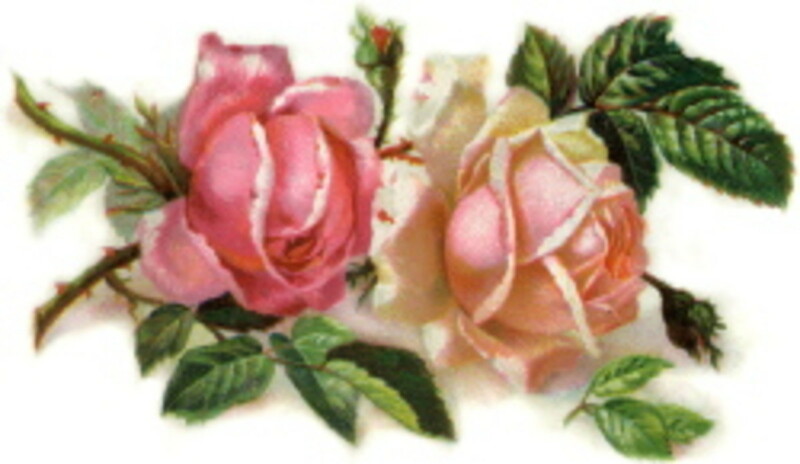 Thanks for your kind comment Happyboomernurse! My daughter actually prefered the Tinkerbell room even though I liked the carousel horses. LOL. Thanks for visiting Amberld! Great hub with terrific and unique decorating ideas for a girl's bedroom. There's something magical about carousels and any child who's been on one should get a thrill from this decorating theme. Even though I don't have any young children or grandchildren, I enjoyed looking at these lovely, whimsical rooms. I would have loved this as a child! maybe I will redo my daughter's Tinker Bell room to this next year! Awesome hub (and photos), Tammy! I personally love the color scheme as well. How could any little girl not like this? Voted up and beautiful! Thanks so much Pamela. I appreciate that. What an absolutely lovely hub! I'm more of the mind to give the child a plain room and lots of love but I think this is a special idea if the little girl and mommy are working on it slowly together. It's amazing how you found all these different products and layouts. Gorgeous little bedrooms. You've got my votes! Pictures are really beautiful.Any girl will be easily pleased with such beautiful rooms you have designed.Beautiful and voting it up. Thanks Susan. Little girls are a whole new bag! I always wanted a fantasy room when I was little. This is one idea that would be a fantasy for any little girl. Thanks for commenting! I always wanted a little girl. I used to dream of decorating a girls room with a canopy bed and lots of frills and lace. I enjoyed this hub, and will keep it mind if ever I have a granddaughter to spoil. I would be there too RealHousewife! It is always bittersweet when the kids pick up a "grown up" room. I love Kirlands too. I wish it were bigger and expanded to include rooms and rooms of stuff. :) I am now debating on a room like this or a fairy room. I'd glady sleep in it. Thanks so much for reading and commenting. Your visits always brighten any room! Hey Tammy - those rooms are beautiful! What a great idea! I am always changing things. I just took my little girls to Kirklands and let them choose some more "grown up" bedroom pictures and wall art. It was so fun! Thanks so much for your visit and kind words prasetio! I appreciate that very much. Very inspiring hub. They look beautiful. I had never seen like this before. Thanks for share with us. I learn something new from you. Well doe and rated up! Thanks for reading Nell. I never got the princess treatment when I was little either. I guess this is why I spoil my daughter so much. I get to live vicariously through her! Boys and boy stuff just isn't the same. My boys didn't care at all what their rooms looked like. I appreciate your visit! You are so kind poetvix! It is my pet peeve that people will take the time to write a great décor hub and not have any or just minimal photos. I appreciate it! I hope your niece will get her own princess room. Every girl deserves one. I appreciate your visit! This is so detailed. It's great and the pictures really allowed me to see what a room like this could be. Further, I like that it will work for more than just a year or two. I think my niece would love a room like this as she is outgrowing Dora fast. I really appreciate your visit and I am glad you enjoyed it. Lovely pictures and a great design idea! Well researched and really interesting! Voting up! I want to start collecting these. I am trying to round up enough décor to do a carousel horse Christmas and full tree. I appreciate you reading and commenting! A neighbor of mine collected these treasures. Wow! Beautiful! We certainly fpherj48 and we don't have any plans to grow up any time soon. I say we go for it. :) Thanks for stopping by! Tammy...I'm sold!! Since there are no longer (human) kids in my home, except for visits....I AM THE RESIDENT "PRINCESS." My hubby calls me the QUEEN, but I like Princess better because they're usually younger! I would LOVE a bedroom like this! We're all little girls at heart, aren't we? AWESOME! I appreciate that. I love it. 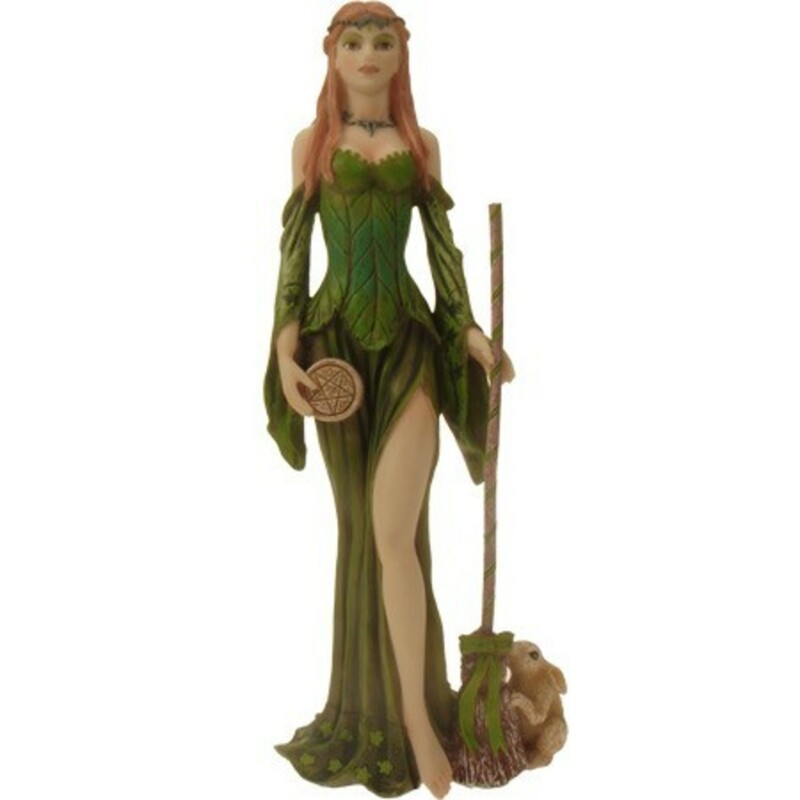 I am going to do one on fairys too. That is my daughter's favorite. This design will please any little girl. Voting this Up and Beautiful. Thanks Ardie! It is never, ever, too late to have a great childhood. Thanks for reading!